Sweet little Pumkin was born approximately mid April, 2014. When Pumpkin came to us with her litter mates, it was easy to see that she could not walk properly on her right front leg. This little girl has a deformity of the bones in that limb that prevented proper formation of her elbow joint. At the moment her leg is splinted in the hopes that the support will help take the pressure off the other limbs as she grows. Unfortunately, there is nothing we can do to “fix” the problem with her leg and elbow. All we can do it splint it and monitor the situation for the time being. She is not in pain or discomfort. Pumpkin is tolerating her splint really well and will have her splint changed frequently as she grows. Please consider giving to help cover Pumpkins costs. Update (September 22): Pumpkin is certainly growing up to be a lovely dog! She is still getting around and does not seem to mind her split. At this point, it’s still to early to tell if Pumpkin’s deformed bones will give her enough support. All we can do is wait and see how she groups and how much support her limb can provide her once the cast is removed. At the moment she is a happy puppy and growing up into a beautiful dog!! We are so glad we can help this girl! Update November 25th: Pumpkin will be undergoing surgery on December 3rd to have her non-functional right front leg amputated. 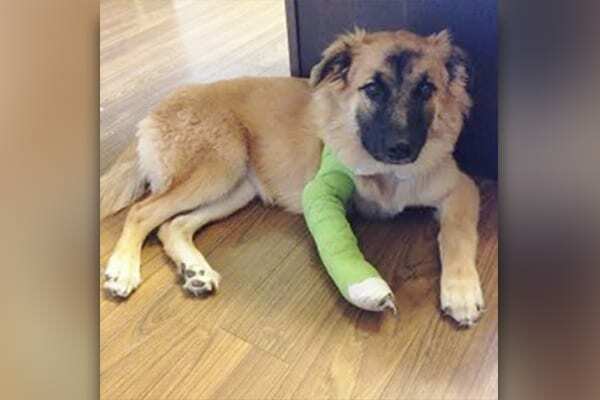 She will be able to live a happy and normal life without the leg, and we hope she will recover quickly and be right back to her normal happy self again! Update – Pumpkin’s foster mom decided to adopt her! She did great after surgery and is now living a happy life in her new forever home!